I have joined this group in the hope of improving my composition and editing of photos taken with my DJI Mavic unless there's a better group here for that kind of critique. 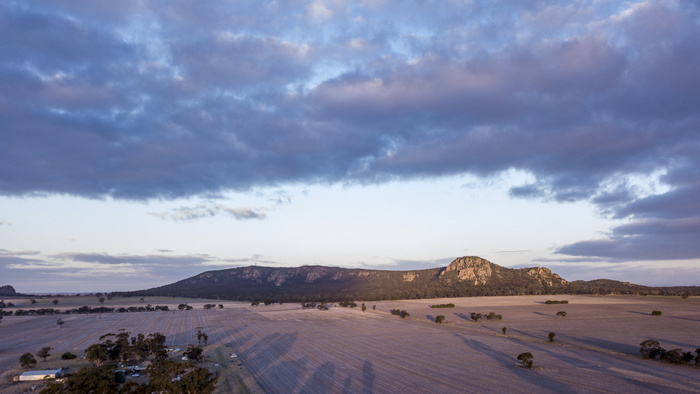 This photo was taken at golden/blue hour the other night of a popular rock-climbing mountain in Australia called Mt Arapiles. I left the long shadows in it but I'm not happy with the farm-house to the left of the shot because I think it is a messy yard and it adds clutter to my shot and I think I need to go back out to that side of the mountain and try again from a different point and also maybe at a time of day when the whole mountain is sunlit? Would love any kind of CC on this photo. Also, the other thing I am struggling with is the fact that the Mavic has a fixed aperture lens of f2.2. Have been reading that I should be using an ND filter on the lens when I shoot. Yes! Look into a set of Polar Pros. I have a set for my P4P an they are wonderful. Specifically the ND/Polarizer set. Thanks Alex. I have a set but to date I have only used it for video work so I can keep the shutter at 180 degrees. Time to learn how to use them to better effect for photography! Okay the best place to start with an image like this is asking what your subject is, or what do you want people to see when they look at this image? I agreed with Alex, this image is missing a subject. In the fstoppers ranking this would be a (drone)snapshot for me. It's not even so obvious it's from a drone. For me the advantage of a drone is, that you can take crazy angles on a subject you could never get with a camera and therefor make them special. That's not the case here. So if you have the opportunity to return you should play around with that.